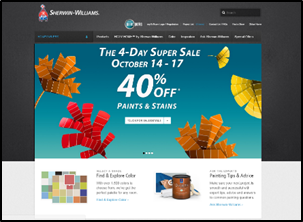 Website home pages for SHW and big box retailers advertise major discounts on US paints, something that has been going on for a while but intensified in October. The move suggests higher than desired inventories and an attempt to move those inventories through discounts in extreme cases as high as 40%. Whether inventories are a function of weaker demand or higher Q3 production is unclear yet, but existing home sales in the US peaked in June and have been falling since. At the same time costs are rising – energy (oil and natural gas) as well as pigments (although the TiO2 increases are small to date and we do not expect anything dramatic here). A significant contributor to paint company earnings growth over the last three to four years has been declining raw materials prices – this trend has now reversed. Incremental margins are very high, and have contributed to earnings growth and escalating returns on capital since 2011/12. They could have an equally dramatic negative impact. SHW is the most levered – with the company offering major discounts on its own “in-store” brands and Valspar products featured in big box retailer discounts. PPG has already guided down for Q3 based on weakness in European auto OEM markets and a decline in US architectural paint margins for Q4 would be another blow. Despite recent under-performance – possibly responding to tepid Q2 commentary from big box retailers, SHW still has considerable downside – more so that PPG in our view. 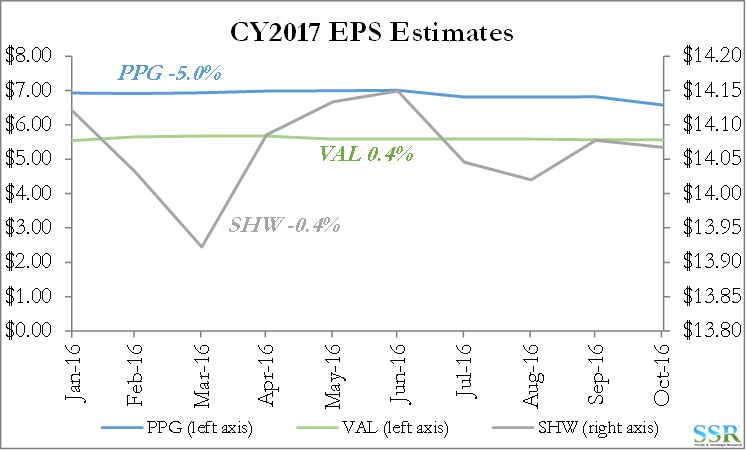 Earnings estimates do not anticipate declines for the rest of 2016 or for 2017. 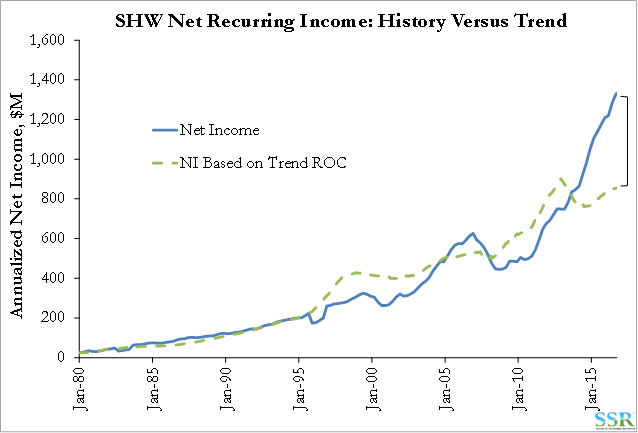 SHW earnings and share price dropped significantly during the housing bubble and the company’s relative PE is significantly higher today than it was before the housing crisis. We don’t feel very positive about the chemical space in general at this time given warnings from PPG, HON, SHLM which suggest a broader demand slowdown than paints. The coatings space is the most expensive within chemicals today – see our monthly. While Ag is the cheapest, we do not recommend a pairs trade as Ag has its own issues. The ethylene chain is the most likely to show Q3 positive surprises. RPM’s business mix may be a little more insulated than the rest – see recent research. Is the US architectural coatings industry painting itself into a corner (sorry, could not resist!) As a man in his 50s I tend to listen to commercial radio geared to my demographic as I drive to work each day. 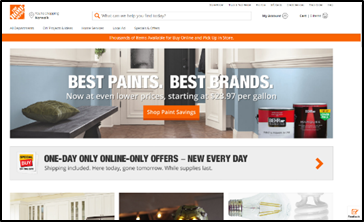 About 4 weeks ago I began to hear Ads for discounted paint from the big-box retailers. It piqued interest at the time but we were distracted with other projects – another Ad last week encouraged us to do more work. Exhibit 2 shows three website home page screen shots from October 14th, suggesting that the paint market might have an inventory problem. 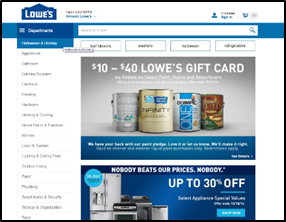 The prominence of paint on both the Home Depot and the Lowes website home page coincides with some radio ad marketing from both over the last couple of months, but things seem to be intensifying in October. While the SHW sales is only dubbed a 4-day event it will have been stimulated by something – most likely inflated inventory at the store level and an attempt to move more product. 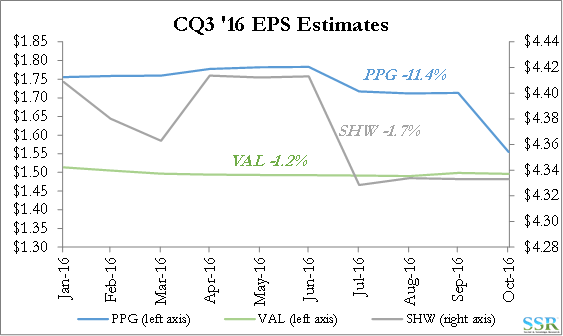 Other companies have commented in earnings guidance about September weakness generally. 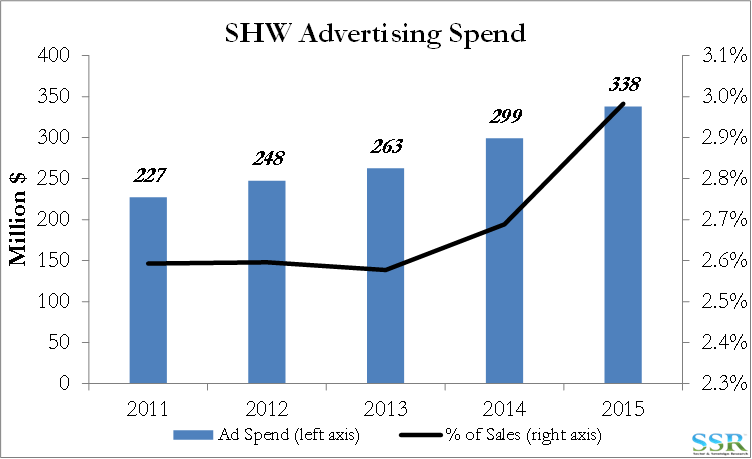 SHW has been increasing advertising spend for a while (Exhibit 3) which suggests that, despite consolidation in the space, there remains significant competition between the leading brands on a national and regional level and also a need to remind consumers that there is an alternative to Home Depot, Lowes, Ace and others. 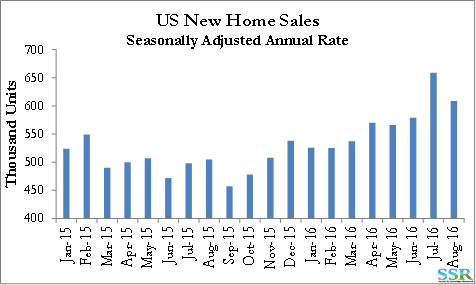 The housing segment in the US is mixed – new home sales are rising from their recent low in September 2015, but dipped in August, and remain well below the housing bubble peak, a level that we do not expect to be reached again in our life-times if at all – not just because of the bubble but also because of demographic and preference changes – Exhibit 4. 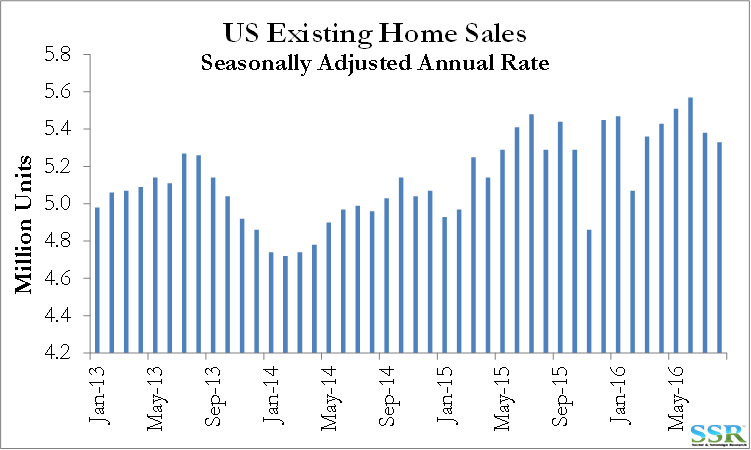 Existing home sales have fallen steadily from a peak in June and this is the much more important market for the architectural paint industry – Exhibit 5. Growth in US existing home sales – in part fueled by low interest rates since a dip in early 2014 has also been a contributor to growth at the paint companies. 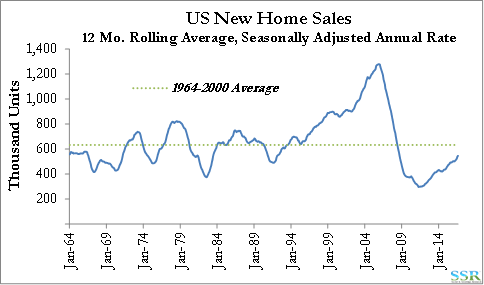 The indicators are not encouraging – lower home resales and now what looks like a bit more price competition in paints while raw materials stabilize and perhaps start to rise again. 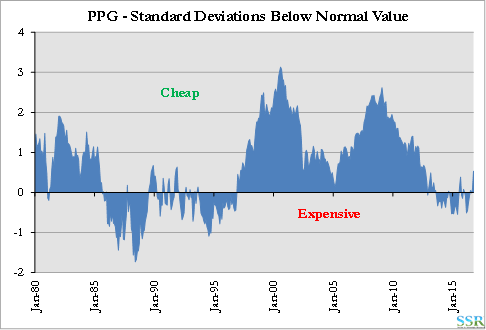 For SHW just to move to 1 standard deviation EXPENSIVE on our metrics from where it is today the stock has 20% downside. 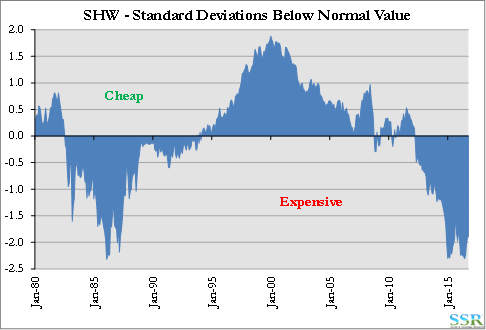 To get to “normal value” it has 45% downside. 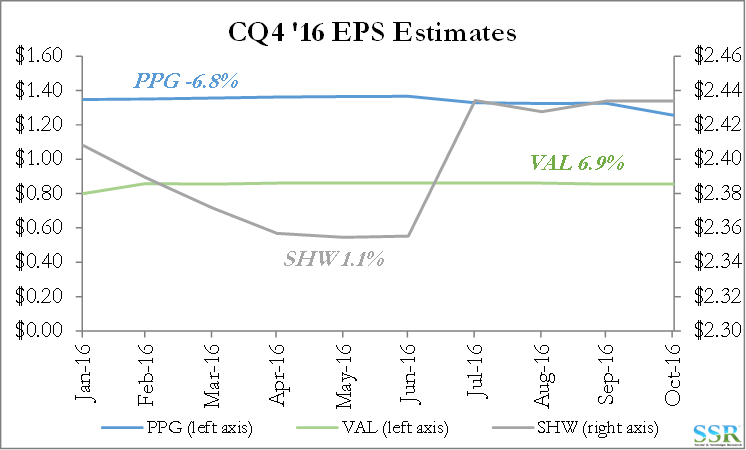 A weaker US paint market is going to make VAL look more expensive for SHW. For PPG we have seen the stock react to the Q3 warning already. Without its chemicals businesses we would not expect to see the valuation swings of the past – but we could easily see another 15-20% downside if the paint discounts continue in the US. We are not sure there is much read through for Akzo as the US paint market has shown the demand and margin inflation of the last few years, leaving Europe behind. RPM is also likely to be more insulated – it does not compete directly into architectural paints and while it might see some volume pull back (already suggested in more cautious guidance), it should not see a pricing impact. 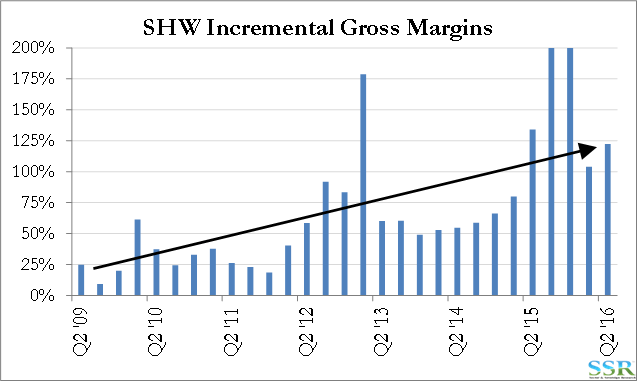 SHW has shown significant incremental gross margin improvements over the last 7 years – Exhibit 6. The quarters which show more than 100% coincide with quarters where raw materials dropped significantly and clearly overstate both the average and the trend. It is not unreasonable to assume that SHW has more than a 65% incremental gross margin on revenue (averages are around 50% already) – possibly as high as 70-75%. The company can drop paint prices by 40% – as advertised – and still make money – just a lot less money. Margins are likely high, but not quite as high for PPG but we cannot recreate the chart as PPG lumps architectural and automotive together and the margin structure in autos is very different. 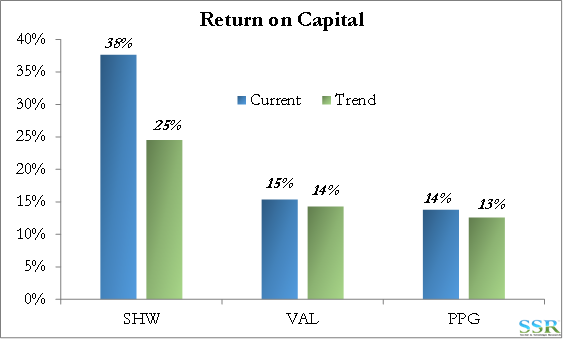 This high incremental margin for SHW has allowed the company’s return on capital to gap upwards in the last few years versus what an historical correlation with return on capital would suggest – Exhibit 7 – and it is one of the reasons why the company screen so expensive on our normalized framework. A 20-30% negative reset in pain prices in the US could quickly bring things back to normal. SHW has seen the most significant increase in return on capital over the last few years – Exhibit 8 – and this is what has made it such a popular story and why we have seen such a dramatic improvement in relative multiple – Exhibit 9. 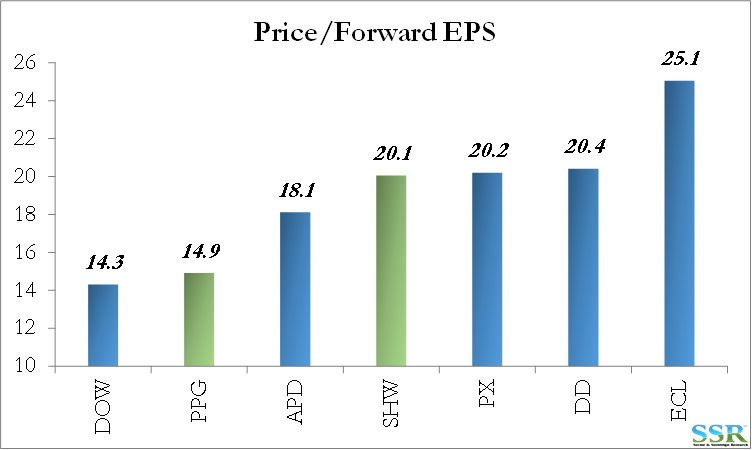 We have seen some Q3 revisions for PPG based on it revised guidance around its European OEM business, but we have not seen any estimate changes to suggest concerns about US architectural paint prices and margins, which dominate the SHW mix and are significant for VAL – Exhibits 10 to 12. Coating companies have seen a significant tail wind from falling raw materials pricing over the last 5 years – enabling SHW to show the greater than 100% incremental gross margin quarters indicated in Exhibit 6. TiO2 pricing started a steady collapse from a peak in 2011, ethylene related products started to fall with crude oil from 2014 and more recently propylene related prices have weakened as the US has overbuild on-purpose capacity and as propane prices have fallen. As we enter Q4 2016 both crude oils and natural gas prices are rising in the US, interestingly at a time when both LNG and propane prices are lower internationally than they were a year ago. 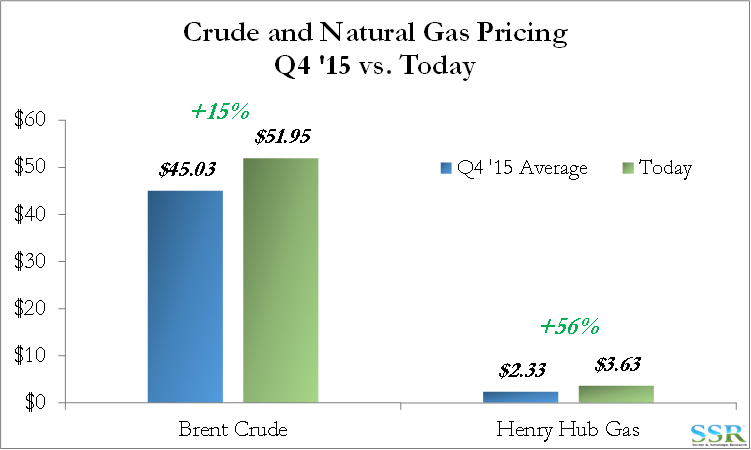 In Exhibit 13 we compare current prices for US natural gas and Brent crude oil with their Q4 2015 averages. How much pricing power the suppliers to the coatings companies have is unclear and we would assume that it is limited. We are not expecting a raw material headwind here, though it is possible, but we are expecting an absence of a tailwind. On the TiO2 side thing are murkier – China competition is high and is likely to remain so and public pricing sources are unreliable given the very wide range of pricing for TiO2 depending on grade and application and the risk that you are not comparing apples to apples. Again we are not really looking for a headwind, just the absence of a tailwind. Below is commentary from the three US publicly traded TiO2 companies at the end of Q2 2016 which is consistent with our view. If the coatings companies are indeed facing price competition and weaker demand, they will use this against their suppliers, but generally in situations such as the one we are cautioning against here, the price decline dwarfs any raw material gains. 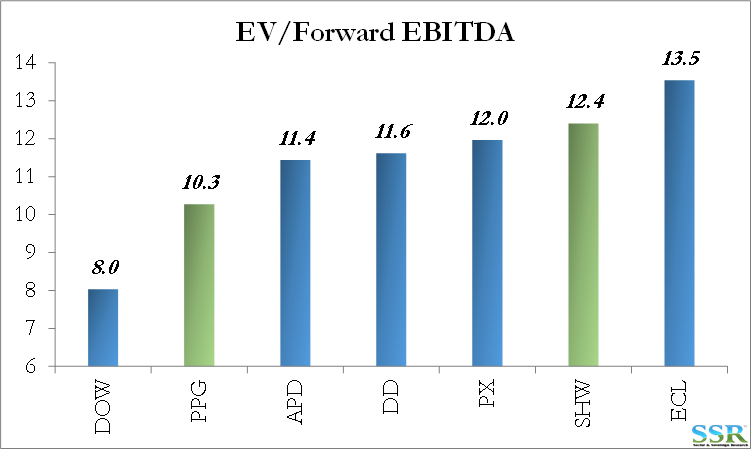 SHW looks comparably much more at risk than PPG, with elevated valuations on a number of metrics. 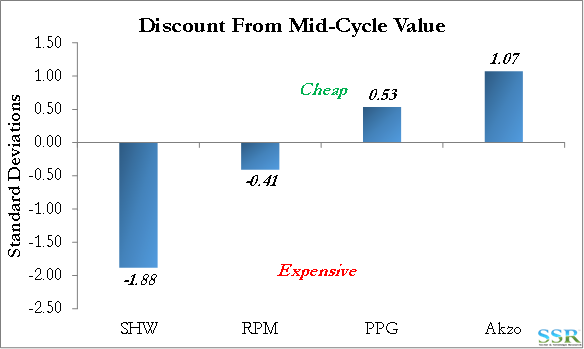 Exhibit 14 compares SHW and PPG on normal value based on return on capital trends. 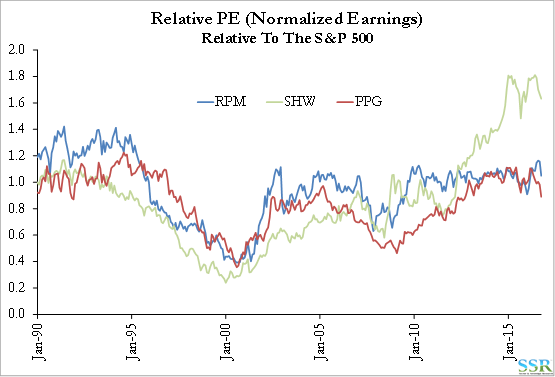 On traditional multiples (EV/EBITDA, Price/Earnings) SHW is also at the higher end relative to PPG – Exhibits 15 and 16. 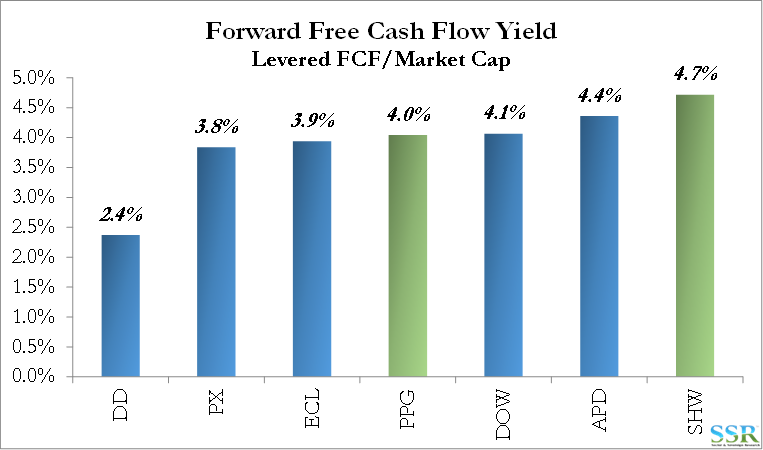 Cash flows are not dissimilar on free cash flow yield basis – Exhibit 17.